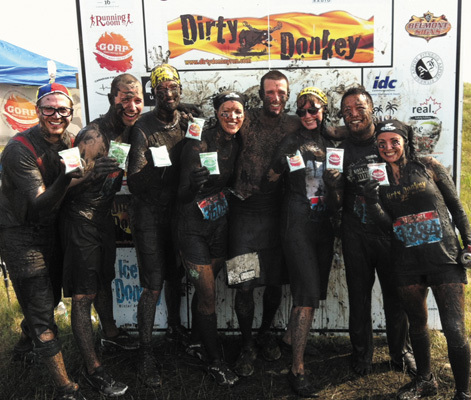 Colleen Dyck (far left) finishes a muddy adventure with the staff of GORP clean energy bars. A Winnipeg farmer ventures into the energy bar industry. 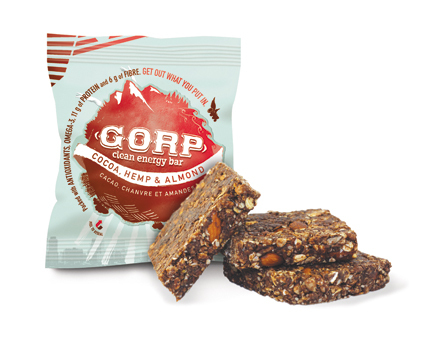 Nearly a decade ago, Colleen Dyck, founder of GORP clean energy bar, dove from an airplane. She tugged the release cable and the parachute came out tangled, so hoisted herself up the rope, while toppling against air currents, and untwisted them before plummeting to the earth. Dyck is an adventurer. She hang glides, competes in triathlons, and paddles through white-water rapids. In the midst of this rip-roaring lifestyle, she needed fuel, something fast and nutritious, but found that supplements made of saturated fat and low-quality protein dominated the market. So, she decided to make her own energy bar, and set out to find the perfect ingredients. Having worked on a farm during college, Dyck relied on her knowledge of agriculture to select each component. Through research, she discovered that organic, vegan, and imported sources have advantages and disadvantages. “I use ingredients from different sectors, organic, local, and commercial,” she said. The honey binding the bar comes from her family’s land, while the brown rice powder, chosen because it doesn’t cause bloating like other proteins, is procured from Axiom Foods in Los Angeles. Launching a startup company always involves overcoming hurdles. Dyck’s began in 2006 when her farmhouse burned down and she moved, with her husband and four children, to her mother’s home in Niverville, Manitoba. This proved to be a blessing in disguise. At the time, she had a long term goal of building a commercial kitchen, a basecamp for her energy bar enterprise. Now that her family needed a new home, she had a good excuse to make one. Dyck, in true entrepreneurial spirit, acted as the general contractor for the new home’s construction. Once complete, she outfitted her 600 sq foot commercial kitchen with cutting edge technology, including a packaging machine that wraps the bars so they are retail ready. Even with this solid foundation, the company faced other obstacles. Her husband Grant was managing a farm, and both struggled juggling the demands of entrepreneurship and parenthood. “With my business being in its infancy, it was just like raising another child,” she confessed. When the bar was finally ready to sell, distributors were wary. Products like energy bars are often shelved in warehouses for several months, and most energy bars don’t have expiry dates like GORP. Keeping to her original vision, Dyck refused to use preservatives. She began experimenting with ways of extending the expiration, including replacing the packaging. The end result is a product made of whole foods that has a shelf life of six months. While coping with these setbacks, and against the advice of her marketing team, she began blogging to vent her emotional frustration. Consumers responded positively by posting comments of encouragement, and they’ve remained a driving force behind the bar’s success. Many health stores were introduced to GORP by eager fans. With this mantra in mind, Dyck encourages the GORP production team to maintain healthy lifestyles. Outside of work, the company pays the entry fees of various races, so staff can compete together through swamp, mud, and snow. When the company accumulates more resources, they plan on visiting Africa to build wells for the needy. Giving back to the world is part of GORP’s mission. Ten per cent of the bar’s net profits are donated to children’s aid programs and third world hunger initiatives. Soon, Dyck hopes to release a product designed to feed struggling populations overseas. The future looks bright for GORP. Since spreading throughout sports and health food stores of Manitoba, the company has gained countless fans, including the Jets. More recently it’s become available at Mountain Equipment Co-ops across Canada, and in the next few months will enter markets in the United States. While some are drawn to this company for its world outlook, when the philosophy is stripped away, you’re still left with a delectable goodie crammed with everything an adventurer needs. For more information about GORP, visit gorpworld.com/ or call 1-855-EAT-GORP. GORP is a leading competitor in the nutritional challenge. and green coffee bean extract. than whey and soy protein. Cliff Bar: 11 grams of soy protein. Bonk Breaker: 8 grams of protein from brown rice. Lara Bar: 6 grams of protein from unsweetened peanuts.